Susan Williams-Ellis took a different direction in the 1970s. 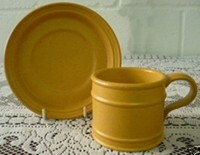 Portmeirion's first new range for 1970 was the simple and rustic looking Portmeirion Meridian range. Meridian was, like Totem, very much in tune with the zeitgeist, this time of the early 70s. However, Portmeirion's most successful range was Botanic Garden, which was launched in 1972. Botanic Garden was based on Victorian plate illustrations from a botany book. Once again Williams-Ellis broke the rules of pottery design. There were different patterns featuring illustrations of different flowers. You could choose a marching set, or make you own set from the different patterns. It proved to be a huge success. Also in 1972 Williams-Ellis designed Kingdom of the Sea, which features pictures of exotic looking fish, shells and other sea life. In spite of the success of Botanic Garden, Susan Williams-Ellis continued to produce a prolific number of new ranges in the 70s: Oranges and Lemons in 1975; Rose and Passion Flower in 1976; and Birds of Britain in 1978. Portmeirion Meridian was Portmeirion's first new range for the 70s. Its simple shape and rustic charm was a departure from the highly stylised designs of the 1960s. Susan Williams-Ellis designed Meridian. Like many of her other designs, the inspiration came from the past. The shape was based on a small Victorian teacup that she found in an antique shop. The main feature of the shape is the four ridges that run along the outside of all the pieces. However, the colours were straight from the palette of the early 70s. Meridian's original speckle matt glaze was finished in plover grey, saffron, terracotta and mocha brown. Meridian followed the trend for more rustic, earthy values that marked the change from the 60s to the 70s. The 'in' piece of furniture of the early 70s was a pine Welsh dresser in traditional style. Portmeirion Meridian would have complemented it perfectly. However, the original range was not produced for very long. In 1973 plover grey, saffron and terracotta were withdrawn and mocha was dropped in 1974. A new range of colours was introduced, including glossy white and several pattern versions. 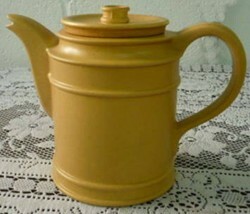 Plain colours green and Rockingham brown were introduced from 1975. Meridian is quite a bargain at the moment. Single pieces go on eBay from £3 to £10 and complete set sells for around £40. Since Meridian in the original colour range was produced for only a few years, this is something of a bargain, especially as the 70s are becoming an increasingly fashionable period. Portmeirion Kingdom of the Sea was inspired by Susan Williams-Ellis' hobby of underwater exploration. 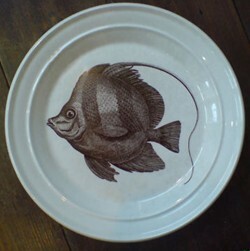 The plates featured images of unusual fish. The images themselves came from a French encyclopaedia of marine life. 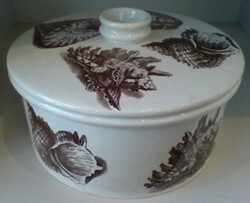 Kingdom of the Sea was produced on the the 'Drum' shape, which was used for the more popular Botanic Garden range. It was similar to the Meridian shape, but without the bands. Whilst the dramatic images of the fish decorated the large plates in the range, they were too big to replicate on smaller pieces. So serving dishes and cups and saucers were decorated with other images from the sea, such as shells. The back stamp on the pieces featured the name of the fish. However, these have been known not to match the fish on the front of the plate! Kingdom of the Sea was not a huge success. The range was discontinued in 1977 meaning it is now quite rare. Kingdom of the Sea is relatively rare, so estimation of values can be difficult. Larger pieces can be worth upwards of £50 individually. "Hi I have a complete magic city coffee set. In very good condition if memory serves me correctly only used two times in its life time. what would roughly be the price guide?